Bottom shelf (pictured above)-I have an 'order' when it comes to my bookshelf and I feel like it's not going to make sense to most people but oh well. All my larger, coffee table sized books are on this shelf, including my prized possession Tim Walker Pictures. This book has a lot of sentimental value to me as I bought it when I was in London on holiday nearly six years ago now. Tim Walker is also my favourite photographer so it's special to me in that regard too. 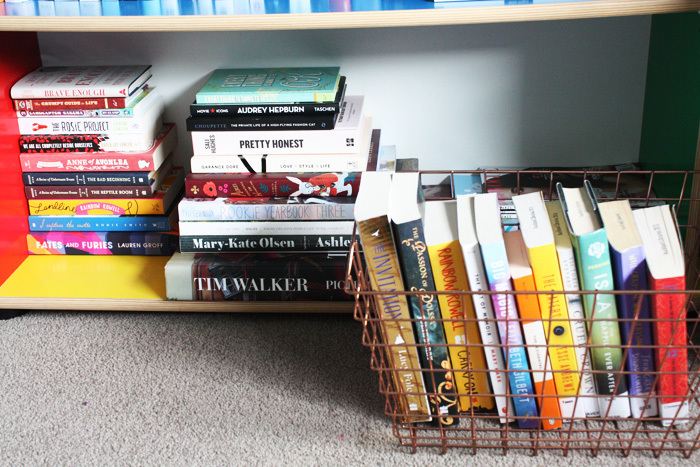 I also keep a lot of my nonfiction books on this shelf as well as my Frankie+Teen Vogue magazines which are hiding behind that basket. That basket by the way is from Kmart, and I think it was $10, possibly less. In here I keep library books, ARCs (advance review copies) and books I've started and put down temporarily. Middle Shelves-Taking these photos has made me realise I like to keep my magazines all down one side. I don't know why that is but obviously there's some logic in my mind as to why they're placed like that. So on these shelves I keep my series; namely the Harry Potter books which are very well loved and also The Selection series. I keep thinner books up here as this shelf isn't really tall enough for me to stand books upright and DVD's. My cookbooks live on this shelf as well as random magazines. The next shelf down is where I keep most of the memoirs I've acquired. Note, Tina Fey and Amy Poehler's books are right next to one another. It couldn't be any other way. I also keep all my classics here as well, including the stunning Puffin in Bloom editions. Down the far side are the majority of my magazines, mainly my Lula magazines but also Kinfolk, Yen and Fete. Top shelf-For some reason I don't have a photo of my top shelf but I can tell you it's mainly where I keep my favourite novels that are standalone books. 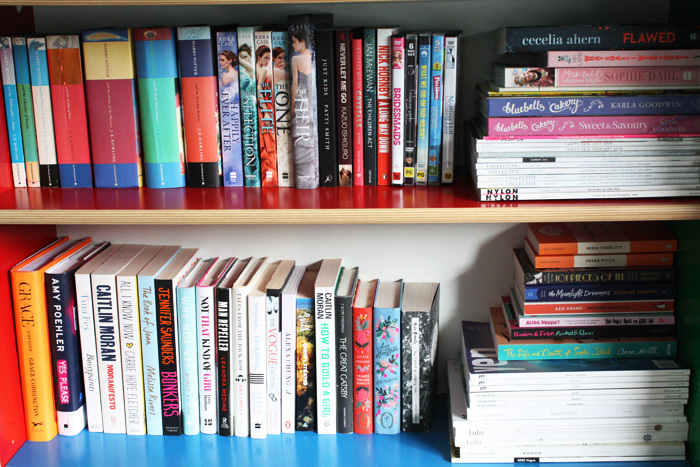 I know Mamrie Hart's book is up there too but favourites on this shelf have to be Gone Girl, Carol and The Fault In Our Stars. I also keep all my Vogues on this shelf too. I surprisingly don't have very many Vogues, I keep my favourites and the rest usually get cut up for mood boards or passed on. Bedside-Or as I call it my bookshelf away from the bookshelf. I try to keep this not too crowded but it never seems to work out. What can I say...I like to be surrounded by all the reading material. 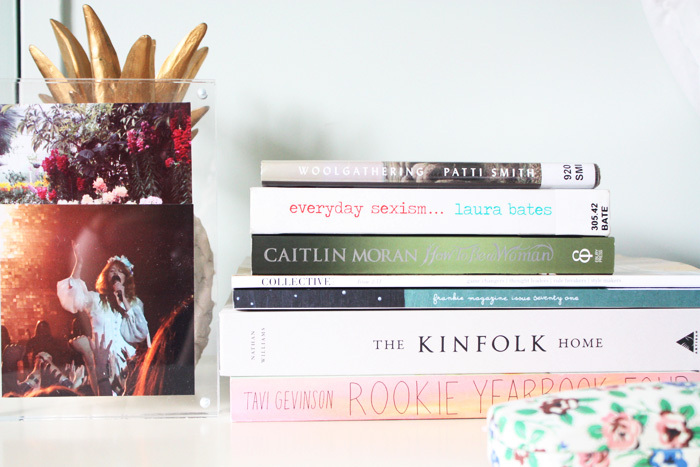 Here is where I keep books I'm currently reading as well as larger books like The Kinfolk Home and Rookie Yearbook 4. The latter I still haven't read but the Kinfolk Home is one I like to dip in and out of. I also keep magazines I'm currently reading here as well as photos and my trusty pineapple. -I hope you enjoyed this post! I realise my bookshelves are nowhere near as organised and structured as other book bloggers but it's a system I have that seems to work and I like it. Like I said above, feel free to leave any questions down below and I will answer them for you.